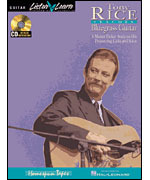 Tony Rice is known world-wide for his spectacular technique, brilliant improvisation and powerful soloing. In this lesson, he personally passes on to you the style he has developed during his two decades as the top bluegrass flatpicker of his generation. In careful detail, Tony analyzes licks, runs, solos and rhythm parts to hot bluegrass songs and fiddle tunes that will challenge and delight all flatpickers. Before long you'll be picking solos to the following essential bluegrass tunes: Red Haired Boy � Little Sadie � Your Love Is like a Flower � Blue Railroad Train � Home from the Forest � Wildwood Flower � Old Train � Wild Horse � and Jerusalem Ridge.